After a few month of straggling, I finally completed our neighborhood map! 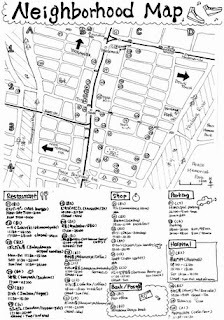 As I am not very good at using computers, it is hand drawing but I hope it will help your small journey around our hostel. It is made by 5 categories; Restaurant (for sure! ), Shop (don't you love shopping? ), Bank/Post (you've got to have some cash! ), Parking(for drivers!) and Hospital (you know, just in case!). Our neighborhood is pretty quiet but still there are many small restaurants especially along the tram line street. Most of them are yummy and reasonable priced! My recommendation is a Japanese cake shop called "Momijian"near by. They have very yummy Japanese sweets. 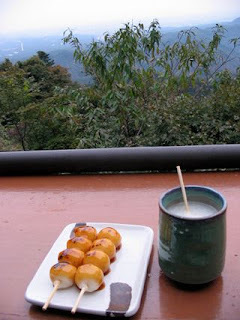 My favorite is Dango ( Japanese dumpling made from rice flour) .They have lots of flavors and it's soft, sometimes it's even warm, not too sweet and really delicious!! It's been very cold lately and my body seems to need some fat to survive ;-) Haha! That'll be very helpful for everyone, guests and staff!! Great job ! !